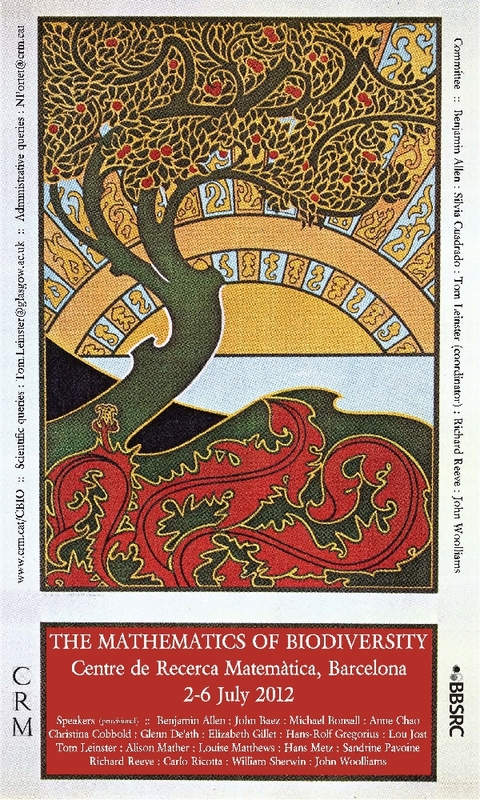 It’s time to continue this information geometry series, because I’ve promised to give the following talk at a conference on the mathematics of biodiversity in early July… and I still need to do some of the research! As is well known, some measures of biodiversity are formally identical to measures of information developed by Shannon and others. Furthermore, Marc Harper has shown that the replicator equation in evolutionary game theory is formally identical to a process of Bayesian inference, which is studied in the field of machine learning using ideas from information geometry. Thus, in this simple model, a population of organisms can be thought of as a ‘hypothesis’ about how to survive, and natural selection acts to update this hypothesis according to Bayes’ rule. The question thus arises to what extent natural changes in biodiversity can be usefully seen as analogous to a form of learning. However, some of the same mathematical structures arise in the study of chemical reaction networks, where the increase of entropy, or more precisely decrease of free energy, is not usually considered a form of ‘learning’. We report on some preliminary work on these issues. However, I hope to bring in some more ideas from physics, the study of biodiversity, and the theory of stochastic Petri nets, also known as chemical reaction networks. So, this series may start to overlap with my network theory posts. We’ll see. We won’t get far today: for now, I just want to review and expand on what we did last time. The replicator equation is a simplified model of how populations change. Suppose we have types of self-replicating entity. I’ll call these entities replicators. I’ll call the types of replicators species, but they don’t need to be species in the biological sense. For example, the replicators could be genes, and the types could be alleles. Or the replicators could be restaurants, and the types could be restaurant chains. So, the population changes at a rate proportional to but the ‘constant of proportionality’ need not be constant: it can be any smooth function of the populations of all the species. We call the fitness of the th species. Of course this model is absurdly general, while still leaving out lots of important effects, like the spatial variation of populations, or the ability for the population of some species to start at zero and become nonzero—which happens thanks to mutation. Nonetheless this model is worth taking a good look at. In other words, I’m thinking of and as functions on the set and multiplying them pointwise. This will be a nice way of thinking if we want to replace this finite set by some more general space. Why would we want to do that? Well, we might be studying lizards with different length tails, and we might find it convenient to think of the set of possible tail lengths as the half-line instead of a finite set. This looks a lot like Schrödinger’s equation, but since there’s no factor of and is real-valued, it’s more like the heat equation or the ‘master equation’, the basic equation of stochastic mechanics. For an explanation of Schrödinger’s equation and the master equation, try Part 12 of the network theory series. In that post I didn’t include a minus sign in front of the That’s no big deal: it’s just a different convention than the one I want today. A more serious issue is that in stochastic mechanics, stands for a probability distribution. This suggests that we should get probabilities into the game somehow. How do these probabilities change with time? Now is the moment for that least loved rule of elementary calculus to come out and take a bow: the quotient rule for derivatives! This has a nice meaning: for the fraction of organisms of the th type to increase, their fitness must exceed the mean fitness. If you’re trying to increase market share, what matters is not how good you are, but how much better than average you are. If everyone else is lousy, you’re in luck. This says how ‘smeared-out’ the overall population is among the various different species. Alternatively, it says how much information it takes, on average, to say which species a randomly chosen organism belongs to. For example, if there are species, all with equal populations, the entropy works out to So in this case, it takes bits of information to say which species a randomly chosen organism belongs to. • Tom Leinster, Measuring biodiversity, Azimuth, 7 November 2011. • Lou Jost, Entropy and diversity, Oikos 113 (2006), 363–375. and I hope to go through quite a bit of it here. But not today! Today I just want to look at a pathetically simple, yet still interesting, example. Thus the probability distribution will become more sharply peaked, and its entropy will eventually approach zero. With a bit more thought you can see that even if more than one species shares the maximum possible fitness, the entropy will eventually decrease, though not approach zero. In other words, the biodiversity will eventually drop as all but the most fit species are overwhelmed. Of course, this is only true in our simple idealization. In reality, biodiversity behaves in more complex ways&mdash;in part because species interact, and in part because mutation tends to smear out the probability distribution We’re not looking at these effects yet. They’re extremely important… in ways we can only fully understand if we start by looking at what happens when they’re not present. In still other words, the population will absorb information from its environment. This should make intuitive sense: the process of natural selection resembles ‘learning’. As fitter organisms become more common and less fit ones die out, the environment puts its stamp on the probability distribution So, this probability distribution should gain information. was the average information required to say which species a randomly chosen organism belongs to. If this entropy is going down, isn’t the population losing information? No, this is a classic sign error. It’s like the concept of ‘work’ in physics. We can talk about the work some system does on its environment, or the work done by the environment on the system, and these are almost the same… except one is minus the other! When you are very ignorant about some system—say, some rolled dice—your estimated probabilities for its various possible states are very smeared-out, so the entropy is large. As you gain information, you revise your probabilities and they typically become more sharply peaked, so goes down. When you know as much as you possibly can, equals zero. So, the entropy is the amount of information you have left to learn: the amount of information you lack, not the amount you have. As you gain information, this goes down. There’s no paradox here. It works the same way with our population of replicators—at least in the special case where the fitness of each species is independent of its population. The probability distribution is like a ‘hypothesis’ assigning to each species the probability that it’s the best at self-replicating. As some replicators die off while others prosper, they gather information their environment, and this hypothesis gets refined. So, the entropy drops. Of course, to make closer contact to reality, we need to go beyond the special case where the fitness of each species is a constant! Marc Harper does this, and I want to talk about his work someday, but first I have a few more remarks to make about the pathetically simple special case I’ve been focusing on. I’ll save these for next time, since I’ve probably strained your patience already. This entry was posted on Friday, June 1st, 2012 at 5:18 am and is filed under biodiversity, biology, information and entropy, probability. You can follow any responses to this entry through the RSS 2.0 feed. You can leave a response, or trackback from your own site. Nature is one tough teacher. Yes: only students who pass every test get to live. Amazing how fast even microbes ‘learn’ with such a strict teacher. The sum in the denominator of should probably be indexed by j. Okay, I’ll do something like that. Replicators with dispersion in rates and adaptation times could probably explain the huge dynamic range in relative abundance distributions. This was touched on in Part 8. I think the use of phrases like “absorb information from the environment” are a little too passive. I’d say a more informative analogy is that processes “acquire information from the environment”, with the process of acquisition being limited to asking questions of the form “I think x is a good answer, am I right?” (i.e., not just yes-no questions but yes-no questions about very specific things). Of course, the diff eqn framework you’re looking at doesn’t use the notion of the fitness of offspring being some function (either stochastic or some other type) of the parents fitness, so there’s no analogue of this effect in what you’re directly looking at. Statements which imply that nature has goals, for example where a species is said to do something “in order to” achieve survival, appear teleological, and therefore invalid. Usually, it is possible to rewrite such sentences to avoid the apparent teleology. Some biology courses have incorporated exercises requiring students to rephrase such sentences so that they do not read teleologically. This is important for avoiding some mistakes. But I think it’ll be very interesting for evolutionary biology to collide with machine learning, where people with goals are designing systems in order to achieve those goals. Deen Abiola’s comments below show what I mean. Here you’re talking about what evolutionary inference “thinks”, which would give you a rap on the knuckles in those biology courses. While variation yielding high evolvability could be useful in the long term, in the short term most of that variation is likely to be a disadvantage. For example, naively it would seem that increasing the mutation rate via a mutator allele would increase evolvability. But as an extreme example, if the mutation rate is too high then all individuals will be dead or at least carry a heavy mutation load. Short-term selection for low variation most of the time is usually thought likely to be more powerful than long-term selection for evolvability, making it difficult for natural selection to cause the evolution of evolvability. When recombination is low, mutator alleles may still sometimes hitchhike on the success of adaptive mutations that they cause. In this case, selection can take place at the level of the lineage. This may explain why mutators are often seen during experimental evolution of microbes. Mutator alleles can also evolve more easily when they only increase mutation rates in nearby DNA sequences, not across the whole genome: this is known as a contingency locus. The evolution of evolvability is less controversial if it occurs via the evolution of sexual reproduction, or via the tendency of variation-generating mechanisms to become more active when an organism is stressed. The yeast prion may also be an example of the evolution of evolvability through evolutionary capacitance. An evolutionary capacitor is a switch that turns genetic variation on and off. This is very much like bet-hedging the risk that a future environment will be similar or different. Theoretical models also predict the evolution of evolvability via modularity. When the costs of evolvability are sufficiently short-lived, more evolvable lineages may be the most successful in the long-term. As some replicators die off while others prosper, they gather information their environment, and this hypothesis gets refined. So, the entropy S(p) drops. We can make this even more precise. and similar for , but with and exchanged. Then for large and will both go to 1/2. Also in this case I would say that the replicators gathered information about their environment (even though this example may not be very realistic) however it appears to me that the entropy becomes maximal. Am I doing something wrong? …doesn’t this depend on what you assume as possible for ? This is my ultimate reason for introducing the pathetically simple special case. However, you’ll note that in this section, I only analyze the behavior of this case as . So, the lessons here won’t apply to more general cases—at least, not without tons of qualifications. Next time I’ll look at the short-time behavior of the same pathetically simple special case, and get some more lessons. I should have made this more clear. I’m not explaining things very well since I’m learning it and/or making it up as I go. Your example is a nice one, since it illustrates the importance of inter-species interactions, which are completely absent in the pathetically simple special case I discussed. I’ll talk more about those later! There’s a lot of interesting stuff to say about how information flows in situations where species are competing or cooperating with each other, but it’s more complicated than “so, the entropy drops”. Very often it rises. I’m happy to see that you are still interested in the topics. I want to recognize some other researchers that have had similar ideas (and that I based some of my work on). In particular, Cosma Shalizi independently discovered the analogy between the discrete replicator dynamic and Bayesian inference; I.M. Bomze was the first (as far as I can tell) to use relative entropy / cross entropy to analyze the replicator dynamic and proved many important results; and Shun-ichi Amari and his many collaborators wrote briefly about the connection between information geometry and the replicator equation circa 1995 and in subsequent works. Unfortunately I found out about much of these researchers’ work after I had finished my graduate thesis — some of it would have been much easier to figure out! In any case, there’s credit where credit is due! Are you aware of the work by machine learning theorist in the area? In particular, the body of work pioneered by Leslie Valiant? The learning power of evolution is characterized in terms of machine learning and its shown to be weaker than many current algorithms (weaker than Probably Approximately Correct, equivalent to correlational statistical queries). Search Valiant Evolution algorithms for interesting reading. Recently, Game Theory has been getting a lot of attention in machine learning – stuff like regret minimization, on line learning and reinforcement learning. Parts of evolutionary game theory see use in coevolutionary optimization – an area I am really interested in. The strength of this new model is not given. But it is not hard to imagine that machine learning algos can be “smarter”. Evolution’s learning ability is clearly surpassed in speed by humans – indeed this fact is what many proponents of a super human AI argue will allow us to produce something smarter than us. it’s happened before. In many areas (where the assumptions of an exponential distribution or convexity or smooth differentiable objective function hold) machine learning algos already surpass everything on the planet. Since the mechanisms by which humans learn, in particular how the brain functions fundamentally, is not known, it may be a stretch to say that “Evolution’s learning ability is clearly surpassed in speed by humans”. It could be evolutionary in some way (which has been proposed by many many people). Some of these models are intellectually pleasing though lacking in evidence (memetics), others have produced remarkably complex behaviors in simulations (Neural Darwinism). I am not looking inside the function. Only the results are needed to make this conclusion. You can capture a very good model of how evolution learns and then ask, what kind of functions can it learn? You can then compare it to humans and computational learning algos. That is what the papers I mentioned above do, one of the authors who has won the computing equivalent of a Nobel prize, for whatever that is worth. I actually specialize in something called Genetic Programming so I have a lot of respect for what we can learn from nature. However, like its natural motivation, genetic programming tends to be very slow because its manner of following a gradient is implicit rather than explicit. I am seeking a way to be able to more explicitly guide this search. Is this similarity only accidental or does it have a meaning?